As one of these commentators I’m wondering what you have proven, apart from the validity of the opinion – which has in the past been accepted as fact anyway. You seem to admit that convection transfers the heat energy from the surface to the atmosphere so the radiative effect cannot be considered in isolation and therefore any calculations which do ignore convection in this energy transfer are numerically invalid. I do recall some climate scientists (Judith Curry was one) admitting that the models really had to model convection properly if they wanted to get more accuracy. Well I agree. Again your energy budget would be more acceptable and simpler if you just used the net emitting value rather than splitting it into up and down radiation. What is the point of the split? To paraphrase Mark, why the love-in with back-radiation over the net value? When you write that “perversely convection acts to reduce temperatures” that is quite wrong. It smoothes them, reducing the peaks that would otherwise occur. However a sudden change in wind direction can cause a sudden temperature increase or drop. If that is maintained over a longer period it leads to a climatic shift. What might cause such a disturbance – orbital wobbles perhaps? There are many papers that describe important climatic events in terms of wind shifts alone so it’s not something to be minimized. Ironic perhaps that even now a lot of people are telling us this that or the next thing is caused by grrenhouse gases when more often it is simply a jet stream shift or a trade wind shift or a prolonged pressure front with no relation to greenhouse gases at all. Lindzen, Spencer argue convincingly that radiative fluctuations are dwarfed by cloud fluctuations even in climate models. So again what you find to be important rather depends on what you assumed to be important in the first place. The arguments in this field tend be circular. Trenberth as it happens is one of those who regularly conflates climate and weather (most notably and bizarrely in the cold snap of 2007) which is why skeptics don’t tend to trust his opinion on anything. Even now he refuses to admit that the missing heat may not be missing at all but may just be a fault in the positive feedback assumptions. If it wasn’t for the ‘travesty’ admission in the climategate emails he likely would not have even admitted publically there was missing heat in the first place – the prevailing excuse at that time being “noise” or “natural variation”. At least he privately admitted those explanations were not good enough. That’s something I suppose. It doesn’t though excuse him from blaming every weather extreme on a dubiously calculated “extra” 4% of water vapour in the atmosphere. Incidentally I replied to you and Mark, the lover of strawmen, on the other thread. Except this is what I have found experimentally…ground temperature is almost always different than the atmospheric temperature “just above” it. 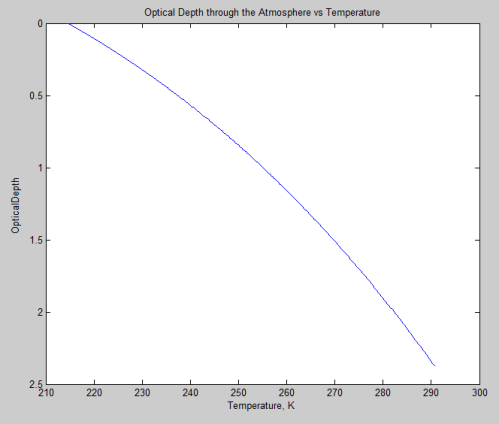 Daytime atmospheric temperatures are generally cooler, and night temperatures are warmer. Are you referring to the 24hour average? Are you referring to ground temperature here, or to temperature gradients? I wasn’t sure. This is a very nice post, though, thank you. Your first graph of temperature vs height could be more useful to readers. First, temperature is the dependent variable and belongs on the y-axis. Second, you’ve chosen an absorption for your grey atmosphere that produces an unreasonable surface temperature. Without convection, surface temperature should be significantly higher than 290 degK; 330 degK according to a graph from J Atmos Sci, 21 p370 (1964) in a recent text (Wallace & Hobbs). Third, if you reorient the graph, you could add a line for the mean lapse rate originating at 288 degK. At altitudes where the slope of the radiative transfer curve is steeper (more negative) than the lapse rate, the atmosphere is unstable and convection reduces the temperature gradient. With the current graph, one needs to envision the reciprocal of the lapse rate and look for places where the temperature vs height curve is too shallow. The altitude where the lapse rate line crosses the radiation line presumably is near the tropopause. On the current graph, there doesn’t appear to be any region where the slope is too shallow – the temperature change is about 30 degK for the first 5 km – so convection isn’t needed. Since the concentration of water vapor varies dramatically with altitude, it may be difficult to produce such a graph. The most useful graph have a relatively accurate curve in the region where radiation dominates energy, not near the surface of the earth. A second graph I’d really like to see is a family of temperature vs height curves with temperature determined solely by radiative equilibrium with 1X, 2X and 4X amounts of GHG absorber (plus a lapse rate). I suspect the you will have to blow up key regions of the graph to show the 1 degK change, but the reality of your “science of doom” is that we are expecting modest changes in parameters that vary widely in nature. Trenberth as it happens is one of those who regularly conflates climate and weather (most notably and bizarrely in the cold snap of 2007) which is why skeptics don’t tend to trust his opinion on anything. Even now he refuses to admit that the missing heat may not be missing at all but may just be a fault in the positive feedback assumptions. If it wasn’t for the ‘travesty’ admission in the climategate emails he likely would not have even admitted publically there was missing heat in the first place – the prevailing excuse at that time being “noise” or “natural variation”. You should read his paper where he actually explained publicly all about this subject. Your first graph of temperature vs height could be more useful to readers. First, temperature is the dependent variable and belongs on the y-axis. It is a climate convention when plotting against height because the y-axis matches the “up” direction. True, but that wasn’t the point of the post. The point is that any climate where heat transfer only takes place by radiation will have net radiation = 0 (in equilibrium). I’m sure many people already know this important concept. But many others don’t and confuse small net radiation with low “radiation impact” (for want of a better term). Whereas the opposite is the case. Scienceofdoom – nice (short) post – but I think when people talk about the relative importance of radiation they are referring to only the longwave (“heat”, thermal, etc.) portion of it. 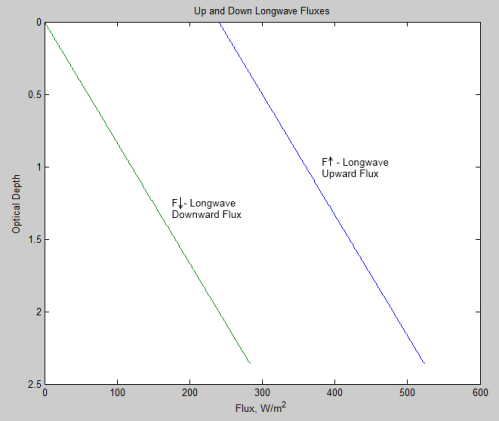 So taking the difference of upward and downward longwave fluxes in your graphs would give exactly 240 W/m^2 – i.e. 100% of the outgoing heat flow is by radiation. As it needs to be in an atmosphere with no convection. I don’t agree with this statement on several grounds. Probably it is my misreading of the post? 1. Convection is the transfer of sensible heat from one point to another by movement of mass. It is NOT conduction of heat from the Surface into the atmosphere, nor is it the boiling off of Water molecules from the surface into the atmosphere. Net Surface Radiation to the atmosphere (Surface radiation-Back Radiation) + Evaporated Water + Conduction (= Absorbed Sunlight at the Surface). Assuming the Absorbed Sunlight at the Surface is constant, then if “Convection [evaporation+conduction?] takes more …heat” then the Net Radiation must necessarily drop. Is it that Science_Of_Doom is adding the LW and SW radiative components at the surface? Even in that case my analysis at 2. above stands. As the temperatures of the atmosphere and the surface increase, the evaporation increases and the NET Radiation drops. Further to my last post, I have re-read the head post. 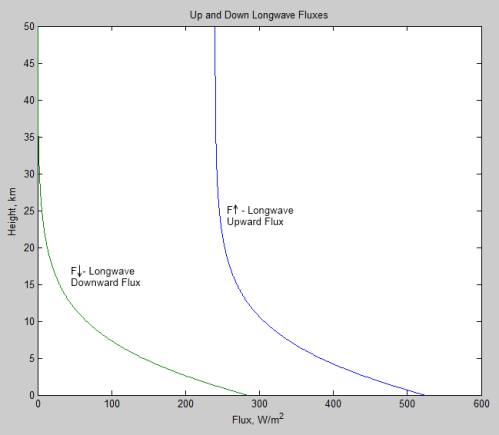 In the strange(but instructive) planet that Science_Of_Doom has described, the difference in the longwave fluxes at every point in the amosphere is 240W/m^2 in an upwards direction: that is the NET Radiation. 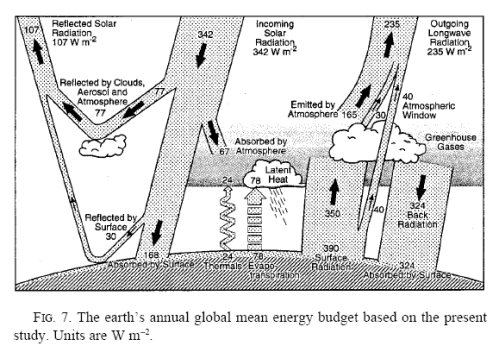 The incoming Sunlight does not interact with the atmosphere in any way – it plays no part in the energy balance at any point in the atmosphere, and I think it is physically misleading to include it in a calculation of Net Radiation. It is thermodynamically more instructive to describe the system as 240W/m ^2 of sunlight converting to 240W/m^2 of NET upward radiation at the Surface, this radiation getting to outer space thgrough the atmosphere. So with zero conduction and zero evaporation, there is a LARGE net radiation from the surface towards space. In the KT world [also a very strange planet] the NET radiation_from_the_surface_which_heats_the_atmosphere is 26W/m^2. This compares with the 24W/m^2 conduction and the 78W/m^2 from condensing water vapour. ie Surface radiation has only one fifth of the effect of the net surface fluxes into the atmosphere. 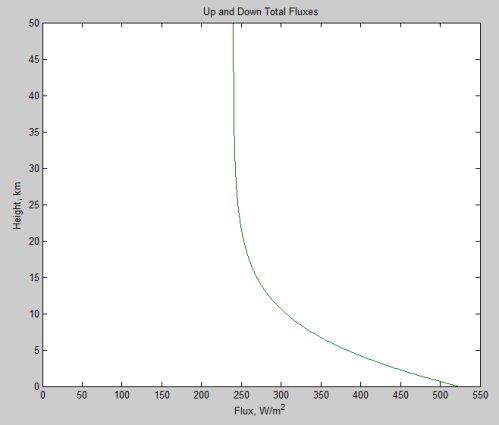 [The remaining flux heating the atmosphere, absorbed sunlight, is also quite large by comparison at 67W/m^2]. All these fluxes are converted to kinetic energy (sensible heat) at the point of entry into the atmosphere. Heated gas rises (convection). It also radiates. My understanding is that convection is the major heat transport mechanism within the Troposphere. It is a SCIENTIFIC convention to place the independent variable or “cause” on the x-axis and the dependent variable or “result” on the y-axis. Most of your readers are used to data presented in this format. Too often it seems, it feels like CLIMATE conventions present data in a manner that obscures the relationship between cause and effect. Question for SOD: Did you accidentally treat B as a constant rather than a variable that depends on temperature, B(T)? dF↑/dχ* = F↑ – πB missing a minus sign? to B = (χ*+1). F0/2π? I’m not sure if F↑ and F↓ are magnitudes or have different signs for different directions. Does F↑ + F↓ = F0 or F↑ – F↓ = F0? Or -F0? Looks like we may need to integrate over X* at some point, but the limits aren’t obvious. The last temperature is about right for earth with no convection, but decreasing water vapor with altitude isn’t compatible with a uniform X*. It is becoming apparent why gray models lack some feature I expect to see. In a world where convection and conduction is significant, the temperature of the ground will almost always be different than the air immediately above it, depending on what you mean by immediately. The thermal conductivity of air is so low that at emperature gradient of tens of degrees per meter must exist in the boundary layer consisting of the first few millimeters above the surface (or more if the local wind velocity is very low) to obtain heat flows on the order of tens of watts/m2. Convection only occurs above this boundary layer so all sensible heat transfer between the air and the ground is, in fact, by conduction only. Convection acts to thin the boundary layer which increases the temperature gradient and the rate of sensible heat transfer. The sea is not an airplane wing. Moving air is not an insulator. Moving the gas removes heat effectively. Cooling my CPU with the same volume of CO2 instead of ordinary air would cool it a little better because of higher heat capacity alone. SOD: I tried applying your gray model to the problem of radiative forcing at 2X CO2. Your model assumes a world at equilibrium, so your equations can’t produce a radiative imbalance of 3.7 W/m2. All they give us is the temperature rise after equilibrium has been restored, which supposed to be 1 degK on our planet for 2X CO2. When X* rises from 0.02 to 0.04 in your gray model, the temperature rises from 215.5 to 216.5. The IPCC thinks we know the radiative forcing of GHG’s to within +/-10%. I assume that we know the absorption spectrum of CO2 to within +/-10%, but converting mixing ratios to radiative forcings appears to require that we pick an the altitude/optical density. If I double X* from 0.04 to 0.08, I get predicted temperature rise of 2.1 degK and if I double from 0.01 to 0.02, I get 0.5 degK. If I double from 1 to 2, the temperature goes up from 27 degK. This implies that forcing varies with altitude. Questions: 1) When converting the optical properties of GHG’s to radiative forcing, does one need to pick an optical density/altitude? 2) If one does pick an altitude, how do we know that the correct altitude has been chosen? If a fixed lapse rate is going to translate a temperature rise at the tropopause back to the surface of the earth, we better start at the correct altitude. Lots of questions, which is good, but so many I’m not sure I can answer them all. In your earlier questions (August 12, 2010 at 5:56 pm) about the maths.. the full solution (using lots of substitutions) is tedious to write out but hard to figure out without me writing it out. The integration is from χ* = 0 at the top of atmosphere to a value we want to find out at z=0. F↑ – F↓ = F0, where F0 is the solar energy absorbed, averaged over the surface area. From August 12, 2010 at 8:15 pm, the missing link here is the radiation to space takes place at higher altitudes as the concentration of “greenhouse” gases increases. The grey model is just a very simple conceptual model to help visualize what happens in the troposphere. Convection actually takes over as the heat transfer mechanism to reduce the lapse rate from its radiative equilibrium. More “greenhouse” gases = the same convective lapse rate but a higher average radiation location to space. A higher location is therefore colder, and therefore less radiation is emitted from the earth’s climate system. Let’s call the new location, L*. 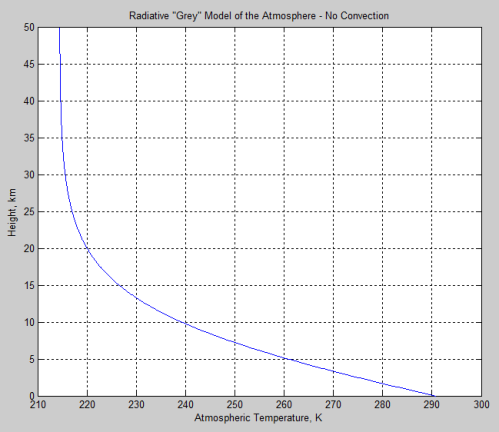 Therefore (with less radiation emitted from the climate system to space), in this simplified model the world heats up, and with the same convective lapse rate the temperature at L* will become higher. Eventually, L* will be hot enough so that the radiation into space matches the solar radiation absorbed. All things being equal of course. The grey model plus convection plus the concept of height of emission into space helps explain some basics of our climate. And why increasing concentration of “greenhouse” gases is worthy of further study.